"Alfred joined Micron as President in 2016 and has been instrumental in overseeing the development of the Company's research and development from design to prototype," said Kal Malhi, Chairman. "In his new role as President and CEO, he will oversee strategic growth initiatives with a focus on accelerating commercialization of our food and cannabis waste processing systems. He will also lead expansion into new product verticals for industries such as food processing, brewing and spirits, pulp and paper and biological pharmaceuticals." Micron's food and Cannavore cannabis waste treatment systems are industrial-grade organic waste processers which pulverize and render organic waste in combination with a proprietary blend of microbes and enzymes designed and developed by Micron. Importantly, as part of Micron's full-system waste treatment platform, effluent from the systems is further treated to derive clean greywater which can be reused in industrial or agricultural operation. Alternatively, the regulatory-compliant greywater, which meets municipal discharge standards, can be safely discharged. Active pharmaceutical ingredients (APIs) in cannabis waste are denatured, preventing bio-accumulation in watersheds. "Over the last year, the Micron team had achieved significant milestones in developing unique, world-class organic waste processing systems for industries with unmet waste challenges," said Mr. Wong. "I am honoured to lead the Company forward as we transition to full-scale production and revenue generation." 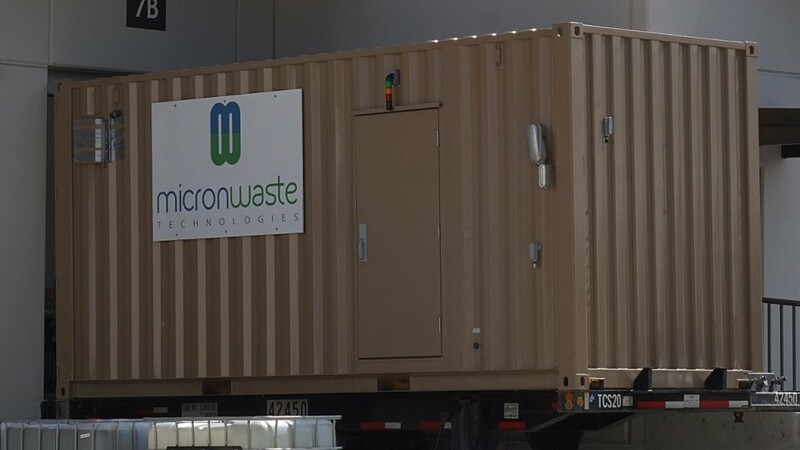 Micron's Cannavore was engineered based on proven technology developed by the Company for its food waste digester unit, which can perform large-scale food waste processing for municipalities, food distributors, and food producers. The Cannavore's innovations resulted from a collaboration with Aurora Cannabis Inc. to develop a clean technology solution to process waste generated from the cultivation of cannabis, with optimization underway at the 55,000 sq. ft. Aurora Mountain facility outside Calgary. Micron's waste management systems employ advanced computer science for remote real-time diagnostics monitoring and control. The mobile, comprehensive units - which do not emit sound or smell - are engineered to operate on-site within a 40 ft. shipping container, deployable on land or at sea, without need to truck, incinerate or landfill methane-producing waste. Micron's strategic initiatives have been accelerated with the recent appointment of several senior executives, including Surj Uppal, Vice President, Business Development; Karen Lauriston, Vice President, Corporate; and Ziba Hajizadeh, Vice President, Engineering. Micron currently has additional Cannavore systems under construction, working with strategic partner BC Research Inc., with manufacturing completion targeted for the second quarter of 2019. Micron's food waste system prototype is currently being upgraded with new technology developed for the Cannavore. Micron is also in the final commissioning phase of its R&D and manufacturing facility in Delta, B.C.. Micron's Cannavore Digester and Organic Waste Digester units have been awarded an Industrial Design Certificate of Registration from the Canadian Intellectual Property Office (CIPO), with patent pending in the United States.